If you like being apart of a large group of financially unsuccessful people, then do we have the opportunity for you! Do you have trouble with the following? Saving more than 4.9% of your income. Having more than $10,000 in retirement savings. You are far from being alone! According to the National Bureau of Economic Research in their report titled “Financially Fragile Households: Evidence and Implications” they’ve found that only 25% of American households could come up with $2,000 if given 30 days. Another 19% believe they might be able to come up with $2,000 in 30 days if they could pawn and sell some of their possessions. Part of the problem is that the American savings rate is currently at 4.9% which means that $2,000 is more than 1 year’s worth of savings for anyone making $40,500 or less per year at 4.9% savings rate. Don’t tell me that you can’t swing more than 4.9%, very few people have less than 4.9% margin in their finances, and any that do can cut out enough to do far better. Do you eat out ever? Literally, do you ever eat food that you didn’t have prepared at your house. Do you have cable, satellite, or any other form of premium TV? Do you have one of the slower high-speed internet offering? I do, and I’m able to stream Netflix without issue. Few people need any of the top offerings, I don’t care how little the additional cost is. Do you go to the movies, bowling, drinking, or any other outside entertainment? Do you have any expensive vices or hobbies? I know these questions indicate that I would expect you to live like a hermit, but if your choice is to end up homeless, or live like a hermit, I’d tell you to live like a hermit for a while. Many of those things I’ve cut out of our lives and we aren’t even in a financial pinch! In another report, 43% of Americans have less than $10,000 in retirement savings. For many people, $10,000 would only be enough to live anywhere from 3 – 10 months! What this tells me is that many Americans are sacrificing their future for today or yesterday. This is a dangerous mindset to have. How can you have any hope for the future when you aren’t helping to grow it? For those who don’t like being apart of the large crowd, you only have to do a few things to change your current direction: save your money. Don’t buy the latest iPad, Kindle, or 3D television, save your money. If you can get your savings rate above the 4.9% average rate, then you’ll be doing better than most of America in just a few short months! Your immediate goals should be to eliminate your debt, increase your savings, and save for retirement. Accumulating stuff should be at the bottom of your list of things. In fact, getting rid of stuff and using that money towards debt might just a great start as well! $2,000 for me would be a reduction in the cushion we keep on a daily basis, so maybe I have too much sitting around, who knows? I’ve always wondered if the savings rate includes contributions towards 401(k) plans. If so, we’re well above average. If not, we’re probably below where we should be. I contribute more than that every month to my 403B, IRA and Roth IRA. I placed savings as a priority because I can not predict how long My wife and I will live nor inflation. My investments will be secondary to my retirement, however I want to travel and enjoy life in retirement. Those are all very noble goals. I’m glad that it seems most of my readers beat the 4.9% savings rate. For any readers reading this that aren’t beating that rate, I want you to make that a primary goal. Please try to save more than 4.9% for the coming year. 🙂 Learn a lesson from the always intelligent KC (http://KrantCents.com), don’t live for today. I honestly don’t believe that only 25% can come up with $2,000. I bet the figure is more like 50%. You can, I can, everybody reading this probably can! I’m not sure as to how they gathered the data. 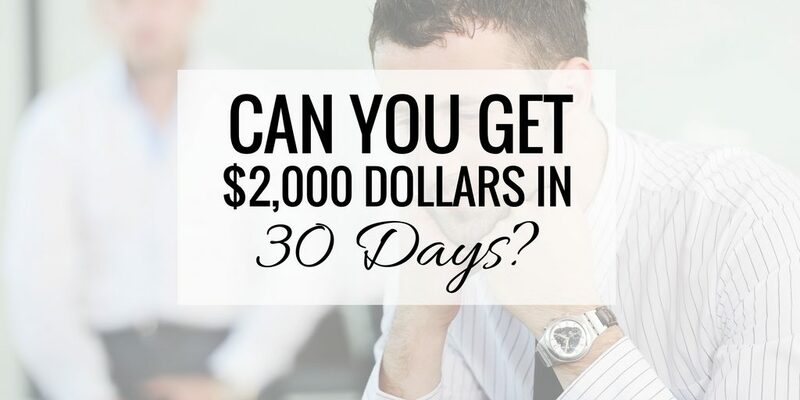 When people hear $2,000 dollars in 30 days, I’m sure their gut instinct is “NO WAY!” But, if you think about all of your options, then I’m sure you’re right. Thanks for stopping in! Staggering stats! Homeless or live like a hermit, logical question, but a lot of illogical people would continue their lifestyles until the very end. Homeless it is! Great article, hopefully more people pay attention and change their mindsets. I’ve seen people make the decision first-hand! It really is mind-blowing, but it happens everyday. It makes me think of the movie “Grown Ups.” I was going to go into more detail, but I don’t want to spoil it for anyone who hasn’t seen it.